Historically, privately held medical practices have “dropped” excess cash through to the bottom line to pay the physician owners/shareholders (Figure 1). Generally, hospitals compensate employed physicians exclusive of the system’s cost structure to run the practice (Figure 2). Of late the mantra rippling across the country is “value vs. volume” or, put more linearly, “less heads in the beds.” This crawl toward, and seriousness in, value based care is evidenced in the Medicare Access and CHIP Reauthorization Act (MACRA) and its component pieces – Merit Incentive Payment System (MIPS) and Alternative Payment Models (APMs). Broadly speaking, MIPS and APMs can financially help or hurt providers and health systems. During the 2000s and today physicians have been, and are, generally compensated based on how many patients they can efficiently see in their practices. Seeing 30 patients a day is certainly (broadly speaking) more profitable than seeing 10 patents per day. Yet, in a MIPS world, that dynamic, and its associated compensation math, will need to change. As we move forward in the brave new world of healthcare delivery, reimbursement paradigms are shifting. Physicians will no longer be rewarded purely on volume driven care. They will need to efficiently manage the volumes of patients they have under a population health/volume based scenario. 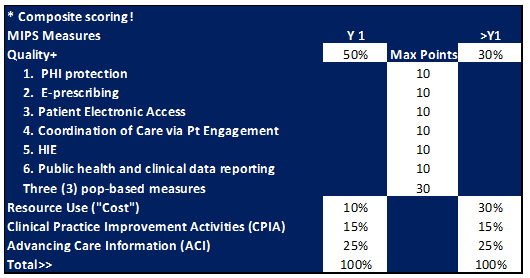 As seen in Figure 5 below, as MACRA unfolds, the complexity of operations and reimbursement will shift. 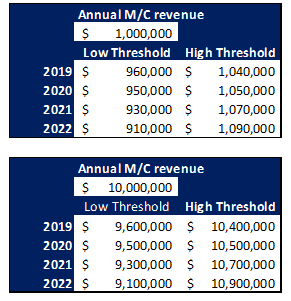 The (hypothetical) figures below display the possible positive and negative impact on the revenues of a practice with, say, $1,000,000 in Medicare revenue and a practice with $10,000,000 in Medicare revenue. Government and private payors are shifting their reimbursement focus to paying for less care in hospitals and reduced readmissions. Whether you’re in an employed model or your physicians press on in private practice, how you manage both the top and bottom lines of the practice’s finances is becoming more acute. And physicians will need to manage the process of care delivery to ensure that all costs are squeezed from the delivery of care to increase margins, whether in fee-for-service, value based delivery, or a hybrid thereof. Are you ready for value-based reimbursement? If you would like more information on how Coker can help you answer these questions and prepare for the future contact us to speak with Jeff Gorke, Senior Vice President.